I love gardens, you won’t be surprised to learn. I love sitting in my garden watching the bees on the flowers and listening to the birds sing. I love going back to gardens I have designed to see how they have changed and grown. But, you may be surprised to learn, I don’t love spending all my free time gardening. I have lots of other interests and enjoy getting out walking, visiting art exhibitions and eating! So for me a weekend isn’t an opportunity to spend every hour in the garden. I became interested in gardens when I first bought a house with a garden and that led me to re-train as a garden designer. I was delighted to learn that garden design involves lots of disciplines. Not just plant knowledge, but also learning about surveying, art history, soil science, spatial design and construction. I have always been interested in just about everything so it suited me down to the ground (no pun intended!). For me, gardens can be a microcosm of life itself. Gardens make me happy. My own garden is my refuge and my delight. When my mother died I went out and took comfort from my garden. During the growing season I check my garden every day to see what has changed. Something has always changed. Like a river, you never step in the same garden twice. Gardens sometimes make me sad, however. These are the gardens that are not fulfilling their potential. The gardens made up of a large area of lawn with very little other planting. Or the gardens that are used as a dumping ground for bicycles. Or the gardens that have been neglected so that everything is growing out of control. These gardens make me sad because I think they are opportunities missed. 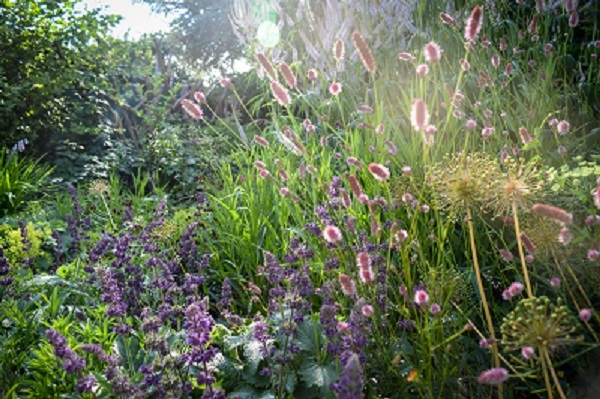 A garden should be a refuge, a place for fun and a link with the natural world. We are lucky if we have a garden. Not everyone has access to their own private outdoor space. So, if we have a garden, why not make the most of it? Many garden owners may feel they don’t have the skills, knowledge or time to make their gardens sing. 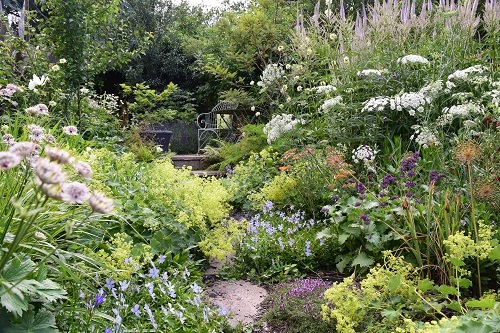 But, after nearly twenty years of making my living as a garden designer, I can tell you that much can be achieved with less effort than you might think. You do need to pay some attention to your garden to get the most out of it, but you don’t need to spend all your free time gardening to have a beautiful garden. Similarly, you don’t have to spend years studying floristry to create gorgeous flower arrangements. It is this belief that led Louise and I to create The Crafty Gardeners. Our philosophy is to share the key tips and essential knowledge to achieve maximum impact with minimum effort. Whether it’s crafting the perfect flower posy or designing a flower bed, we want to help our students get the most out of gardens and flowers as easily as possible. We believe that spending time in a garden, or arranging flowers, lifts your spirits and improves your health. Everyone should have a chance to experience the benefits. It’s easier than you might think once you’ve attended a Crafty Gardeners workshop.